I like bossa nova, but the idea of fusing jazz and bossa nova is not much to my liking. Perhaps Tom Jobim would feel the same way if had heard the interpretation of his compositions turned into jazz, with all the drumming by Sal Ferreras and the bass guitar of Ricardo Medeiros. 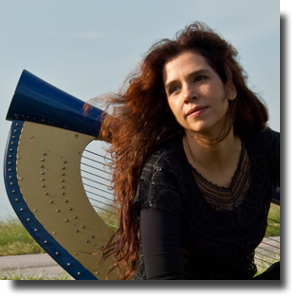 He would be pleased perhaps with the concept of Cristina Braga vocalizing and playing the harp, a delicate instrument like the guitar Jobim used when he sang "Desafinado" and "Triste". But again, why mix jazz, unless it's soft jazz, with bossa nova? If only Ferreras toned it down, instead of beating those drums as if he were Ringo Starr, perhaps this show would have felt more like what the lyrics of Jobim were meant to be--soft, delicate, and truly what bossa nova is all about. I would excuse Braga for being out of tune when she sang "Desafinado" because that's what the song means--"out of tune". But not when she sang "Triste" or "So Danca Samba". She just wasn't hitting those notes right with her raspy, gravel voice. The trio redeemed themselves, however, when they did their encore number, the ever popular "Girl from Ipanema", but again, they ruined the song by doing what I felt was tasteless--a big show-off with drums and base guitar, ending the piece as though saying, "It's time for rock-n-roll". I was also disappointed when the programme listed "Manha de Carnaval", and it wasn't performed.